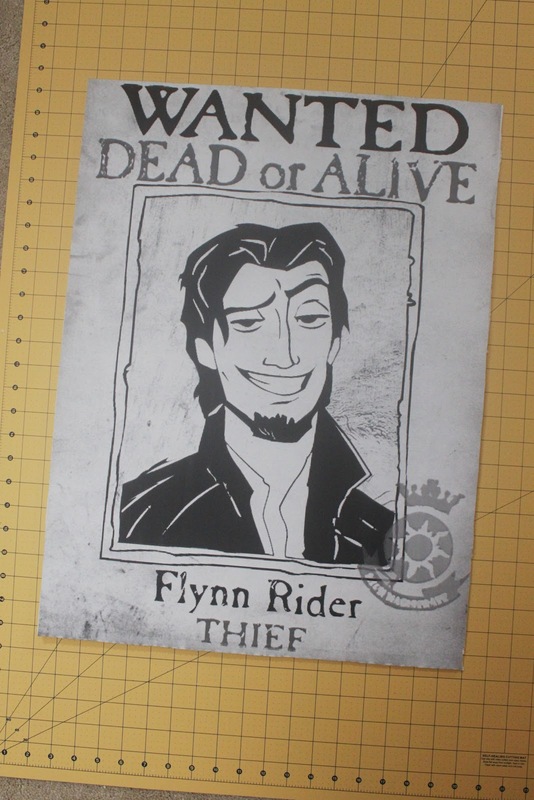 I had a second engineer print made, just as I had for the "wanted" photo booth HERE, but this time I didn't cut out the middle. The poster was simply taped to the wall with tape. I found the noses online by googling "nose caricatures." After sorting through a bunch of nonsense, I found this page full of perfect noses on everyonecandraw.net. I used my Silhouette Cameo to cut them out on card stock. For this game, I found the template and tutorial on how to make cute Pascal party blowers on DisneyFamily.com. I then attached some adhesive velcro to the tip of Pascal's "tongue" and adhered the other side of the velcro to some fruit images I printed out. The kids were then challenged to use Pascal's tongue to pick up as many pieces of fruit as they could in under a minute. (No picture because we didn't get to this one.) I partnered the kids up and gave each partner a roll of yellow streamers. The kids were told to tangle their partner up in the streamer as fast as they could. The child who tangled up his partner the fastest won a prize. I purchased a stack of colored card stock and adhesive foam shapes and allowed the kids to decorate their own lanterns. I also brought my daughter's supply of stickers, markers and crayons from home. When the kids were done, I used a hole punch to punch 2 holes in the top and attach clear line to hang. Easy and cute! I will say, after all the preparation I did for the games, the kids were too busy making their own fun (which was great!) so we were only able to do 2 of the games. Next time, I think I'll stick to a craft and 1 game. Hi there! Very cute ideas! I was wondering if you still have the image/link/pin of the fruits - the ones you used for the Pascal game? Thank you for linking the images of the noses. I plan to use that game today. There is nothing like blindfolding a child, spinning them around and around to see where they end up, LOL!